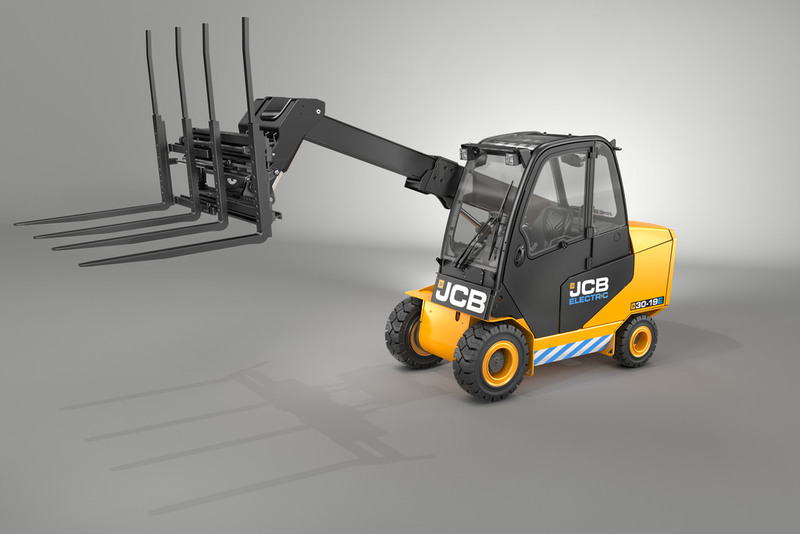 Launched in October 1997, the JCB Teletruk remains the world’s only telescopic lift truck and offers users the benefit of forward reach thanks to its telescopic boom. The JCB 30-19E is the first electric powered model in the range. 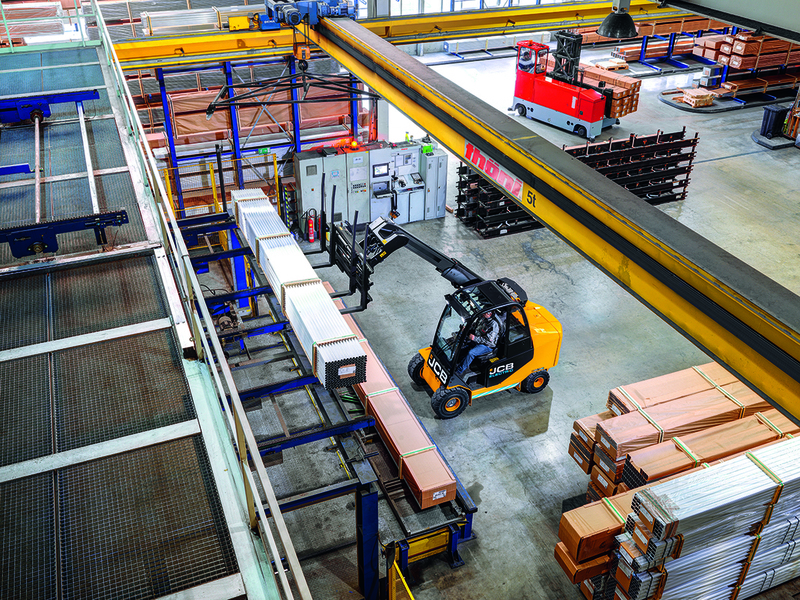 Already in operation at many supply chain and manufacturing facilities across the world, the Teletruk is the ideal choice of lift truck at sites where containers, curtainsided trailers, vans and other delivery vehicles have to be loaded and unloaded quickly, safely and efficiently, says the firm. Because it is battery-powered, the JCB 30-19E is quiet and produces zero emissions – making it suited to tasks inside a building, while its fully sealed, weather-proof body protects the machine’s driveline and other key components from the elements when the Teletruk is required to work in the yard. Power is provided by an 80-volt lead acid battery which can work a full eight hour shift on a single charge. The battery compartment is positioned at the rear of the truck and has been designed to allow quick and easy battery changeover. Using a single point hoist or another lift truck, the battery can be swapped in around 2 minutes. The new JCB Teletruk can climb a 21% gradient or ramp with ease and productivity is further enhanced with full free lift of 1575mm as standard. Like all Teletruk models, the JCB 30-19E features a side-mounted boom and using the unique telescopic forward reach, it has a lift capacity of 1900kg at 2 metres, meaning palletised loads weighing can be loaded to the far side of a curtainsided trailer. In addition, the forward reach functionality eliminates the risk of material and vehicle damage - as well as the potential for injury to personnel - when loading or unloading pallets to and from light goods vehicles, especially vans. 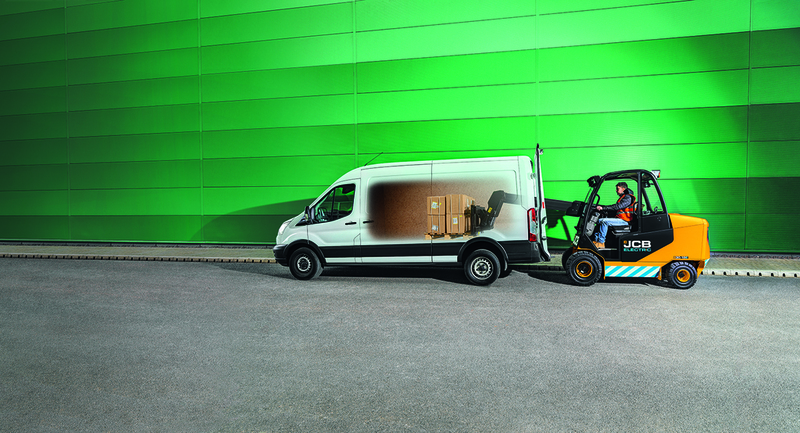 The Teletruk can place a 1600kg load 3 metres into a van – allowing full utilisation of extended wheel-base vehicles. 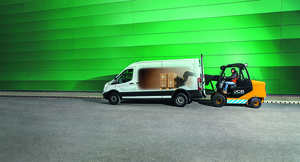 For ultimate efficiency, the Teletruk can load three Euro pallets into a van easily and safely within two minutes. All machines are fitted with Load Motion Control. This patented JCB innovation alerts the operator when reaching full lift or reach capacity with a simple green, amber, red light system and will not allow a load to be used outside of the load capabilities of the machine, aiding the prevention of forward tip. The JCB 30-19E Teletruk’s ability to operate both inside and outside a building brings a number of benefits to the user. For example, working inside a building, the JCB 30-19E can enter a container that has been reversed in to a sealed loading dock and use its telescopic boom to safely stuff and de-stuff loads far more time - and space - efficiently than is possible with a conventional counterbalanced forklift or stacker. This increases utilisation of vehicles, aisle trucks and goods in/out infrastructure. 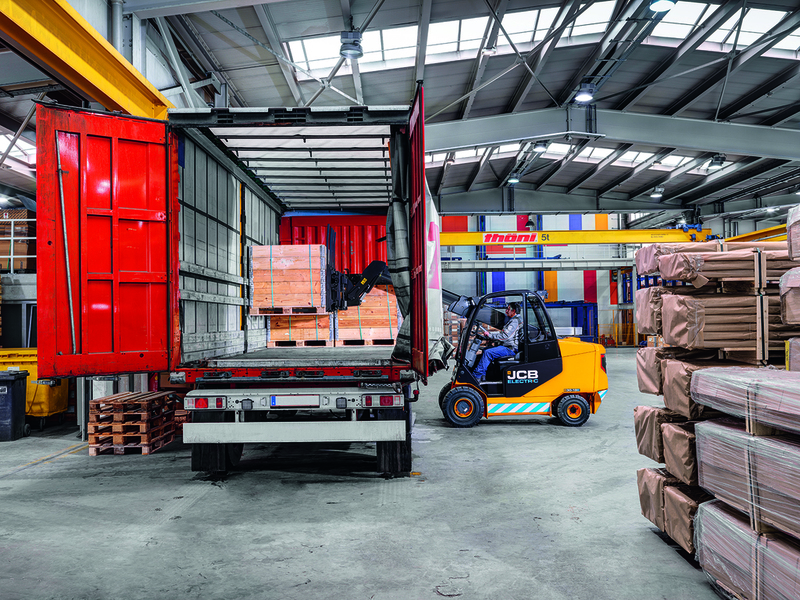 JCB Industrial general manager Paul Murray said: “JCB originally developed the Teletruk in response to market requirements for a lift truck with the ability to load a wide range of delivery vehicles quickly and safely in the most space-efficient way. 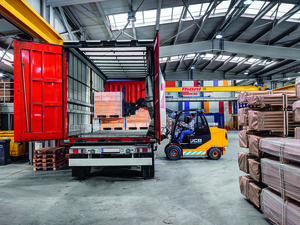 Its unique design and functionality has won numerous awards – including the Fork Lift Truck Association (FLTA) award for Innovation, Safety and Ergonomics. Paul Murray added: “Almost 250,000 electric forklifts are sold around the world every year, with Europe accounting for almost two thirds of the market.